This beautiful hike takes place in a unique valley, and it is the most popular. You will experience a variety of waterfalls ranging in height from 10 to 40 feet on two different streams. Under each of the falls, there are clear and large swimming holes. For additional thrills, there are several areas where you can safely jump from rock ledges into the waterfall pools down below. This makes for an excellent photo opportunity! 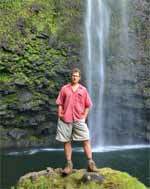 The naturalist guides will teach you about Maui’s wonders. 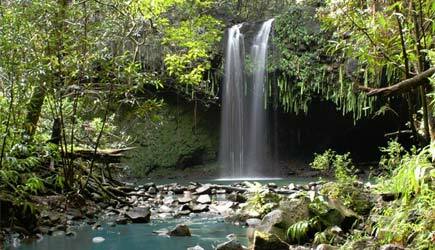 You will end the hike under a Hawaiian waterfall for a natural “shower”. The largest of the falls has ferns draping down from a huge overhanging ledge, and you can walk completely behind it! Check In: Meet your guide at the Park-n-Ride lot in Kahului. (near the intersection of Highway 350 & Highway 380). Complimentary pick up is also available at Kahului Harbor for Pride of America guests. 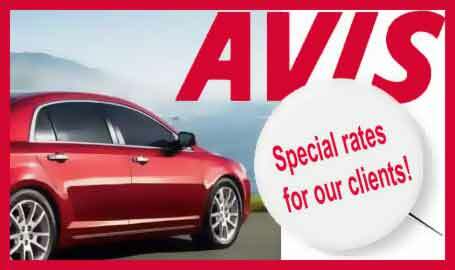 Pickup from South Shore and West Side hotels is available for $30 per person for those without rental cars. What to Bring & Wear: Running shoes or sports sandals that can get wet and muddy. Shorts and short-sleeved shirts or t-shirts. If mosquitoes really bother you (your guide carries repellent), you could wear long pants and a long-sleeved shirt. Wear a swimsuit underneath so you can swim in the waterfall pools. Bring a towel and sunscreen and your camera & phone in a Ziploc or waterproof bag. 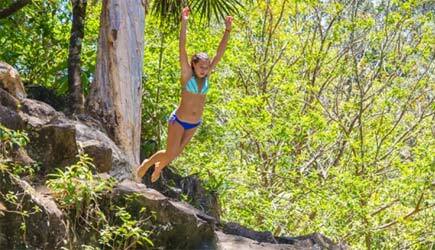 Jump into the fresh water pools! NCL cruise ship passengers in Kahului are able to do either the East Maui Waterfall Hike or the Short Waterfall Walk on either their first or second day in port. Pickup will be at the Maui Mall, which is a short walk from Kahului Harbor. The Hana Waterfall Hike is the only one of these tours that doesn’t fit your itinerary. Obviously a guide also knows exactly where these places are so your day in the magical rainforest or volcanic landscape is maximized. No hunting for that elusive waterfall … you’ll go straight there and have more time to soak it all in. A guide who knows the “aina” will help keep you safe, and provide support if you need it. Would you like to jump off a cliff into a waterfall pool below? Doesn’t it sound like a good idea to have a guide who can tell you where it is safe to jump and where there a rocks hiding below the surface??? The East Maui Waterfall Hike is the most popular tour. This is the event that will truly make you glad you had a guide with you. As you hike through an “off-the-grid” farming area you’ll taste fruit you’ve maybe never seen before. Your guide will impress you with his or her ability to take plants from the jungle and demonstrate uses you’ve never thought of. You’ll probably learn what a tapioca plant looks like (yes, it comes from a plant … not from a jar with the Gerber Baby on it).